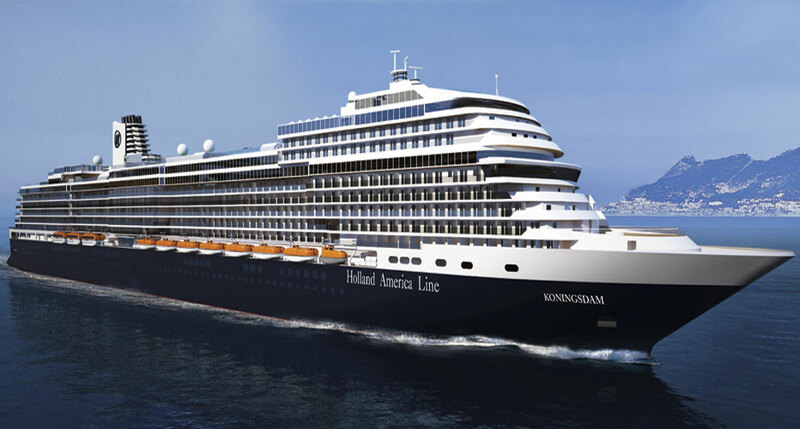 Holland America have yet again released more details about it;s upcoming cruise ship the ms Koningsdam. This time it’s all about the staterooms the new 99,200 ton cruise ship will be offering to guests. The ship will debut brand new purpose-built staterooms for families, singles along with more options on the cruise lines usual stateroom categories such as Neptune, Signature and Vista suites. The 32 new specially designed family ocean-view staterooms will range from 222 to 231 square feet and feature special amenities such as two bathrooms and accommodations for five people. The 12 single ocean-view cabins will range from 127 to 172 square feet in size and will be available on multiple decks at a variety of forward, mid-ship and aft locations. Pinnacle and Neptune Suite amenities also include corsages and boutonnieres for the first formal night, a cocktail party with the ship’s officers, priority dining and seating requests, binoculars and umbrellas for use during the cruise, a wall-unit bar, cold hors d’oeuvres served before dinner each evening on request and complimentary laundry, pressing and dry cleaning throughout the cruise and more. The 14 Signature Suites are up to 400 square feet in size and the 104 Vista Suites range from 260 to 356 square feet. Signature and Vista suite guests receive many special amenities, including personalized cruise stationery, oversized bath towels, fresh flowers, a pillow menu, mini bar and one-touch phone concierge service. The ship will have the most staterooms with verandahs in the Holland America Line fleet with 912 total from Verandah to Pinnacle Suite categories. Guests looking to focus on health and wellness during the cruise can book verandah spa accommodations, conveniently located near the Greenhouse Spa & Salon that come with yoga mats for use during the voyage and an iPod docking station. For guests looking for a more affordable option, the line is offering 266 standard or large interior accommodations up to 225 square feet.